There are a few tricks to making the perfect angel food cake. First, when you are baking an angel food cake in a removable-bottom tube pan, make sure the pan is clean, dry, and ungreased, without even a trace of any fat or grease, or cake won’t rise. 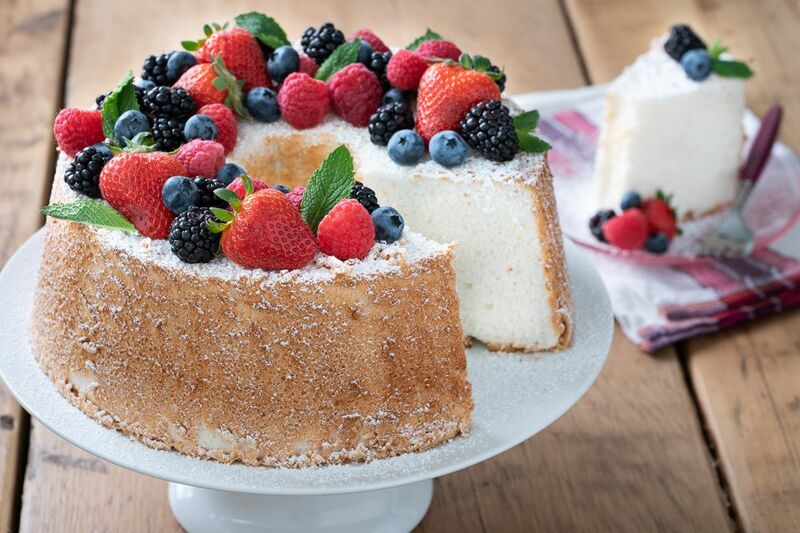 What gives angel food cake its height and delicate, fluffy texture is how the whipped egg-white batter slowly climbs up the sides of the pan as it bakes and sticks to stay put. The second trick to the perfect angel food cake is how it is cooled. Once the cake comes out of the oven, to maintain that gorgeous height and elegant texture, the cake must be turned upside down and cooled completely before removing it from the pan. This keeps the weight of the cake from pushing down on itself as it cools. The cake sticks to the side of the pan until you are ready to run a knife along the outside of the pan to gently release it from sides. Sift flour and 3/4 cup of the sugar together 3 times. Beat egg whites with salt and cream of tartar in large bowl on the highest speed of an electric mixer until it is light and fluffy. If you have no mixer, you can use a whisk but be prepared for a workout. Sprinkle the remaining 3/4 cup of sugar over egg whites, 2 tablespoons at a time, beating thoroughly after each addition. Fold in vanilla and almond extracts. Sift dry ingredients, 2 tablespoons at a time, onto the beaten egg whites. Fold in gently but thoroughly with a wire whip or rubber spatula. Pour batter into ungreased tube pan (10 x 4 inches). Make sure that there is not a trace of any fat or grease in pan, or cake won’t rise. Draw a skewer gently through batter in a swirly pattern to remove large air bubbles. Bake in preheated 350 F. oven for 40-50 minutes or until crust is golden brown and cracks are very dry. If your tube pan has legs (like the one seen here), invert and allow to cool at least one hour. If your tube pan does not have legs, invert the pan over a bottle to cool. Once cooled, run a knife along the outside and carefully remove the cake from the pan. Place on a serving plate. Dust with powdered sugar and serve with fresh fruit.